Submitted by lynn on Monday, November 16, 2015 - 6:32pm. I kept hearing about Coop's West Texas BBQ from local food bloggers so I mentioned it to Dennis. I'm down he said. Time passed. I read over and over again that it was one of the best by members of Eating Drinking San Diego! Let's goooooo he said again. More time passed. Then I finally said "Let's go Sunday." Dennis's eyes lit up. Time to venture out into EAST COUNTY, a galaxy far, far away... or so I thought. Google maps estimated 30 minutes to drive without traffic, which isn't bad at all! We carpooled with my brother because another Texan would provide more perspective of Texas BBQ. Plus, more people equals more food. Win. Coop's BBQ was quite busy when we came in on a Sunday at 6:15pm. There was a line to order and we noticed people taking food to go in HUGE bags. The best deal looked to be the Knockout Combo for $30.99. 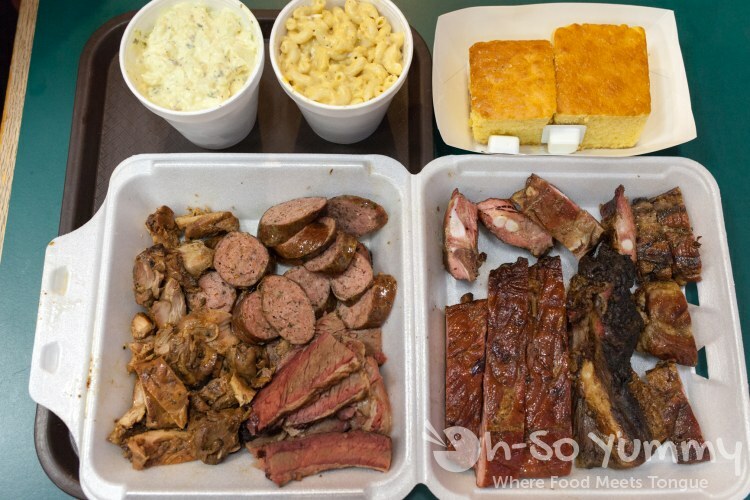 It offered six meats (a total of 3 lbs) plus two large sides and cornbread. The box we received was PACKED! Here's the full combination platter spread out. That's a LOT of food! 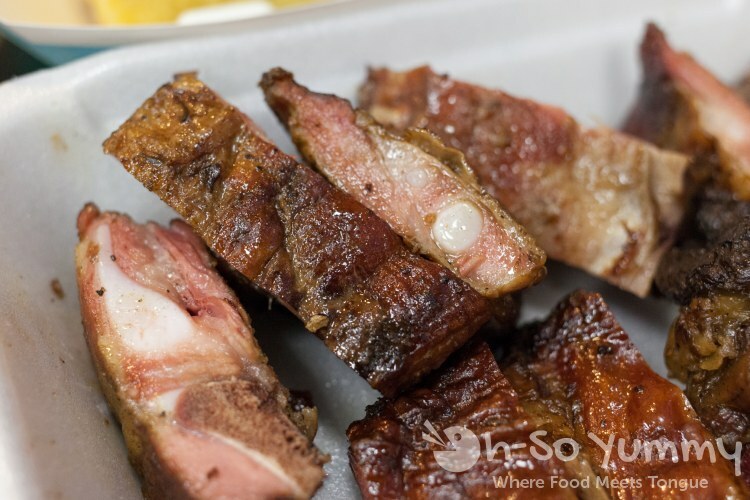 We like that the meats come without BBQ sauce so you can actually taste them. Each table has a squeeze bottle of their BBQ sauce, medium consistency, sweet but not like crazy sweet, maybe a bit of brown sugar or molasses? We found the Jerk Chicken to have that jerk flavor but without the spice. Dennis is a medium spice kind of guy but craves for Jerk Chicken to be VERY spicy. It is one of the few times he's happy to suffer the burn but this was a letdown. Removing the spice aspect, it was still tasty and tender, with a little bit of resistance to the bite, much better than Sque's chicken. The Pork Tips were firm but not overdone. There was a good salty flavor and a slightly fatty consistency per bite. 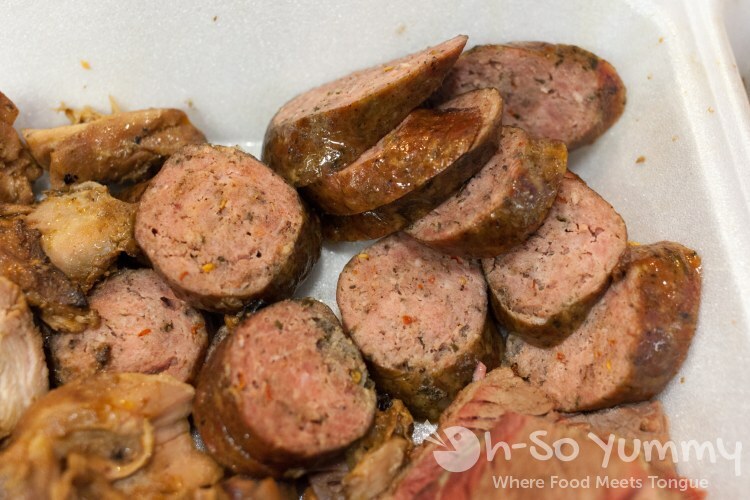 These Sausages were slightly spicy with flavor and didn't leave a heavy feeling. It seemed to be leaner and drier, reminding me of the deer sausage my mom brings us for the holidays. 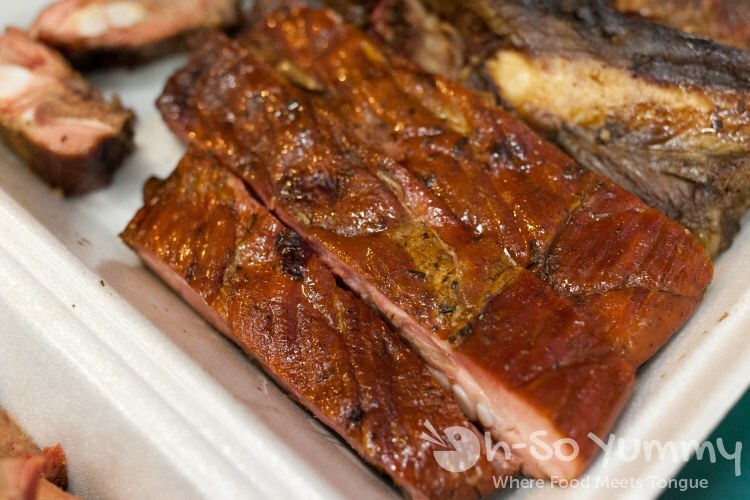 The Pork Ribs were long pieces, salty and tender with a nice bark, though not as much meat per bone as others we've had. After eating everything and coming back for round two, the saltiness was getting to Dennis. Adding the sweet BBQ sauce seemed to do the trick. We were disappointed in our Beef Rib though. It looked charred and dry before we even had a bite. I could barely cut off the meat to get it onto my plate because it was sticking to the bone so much. 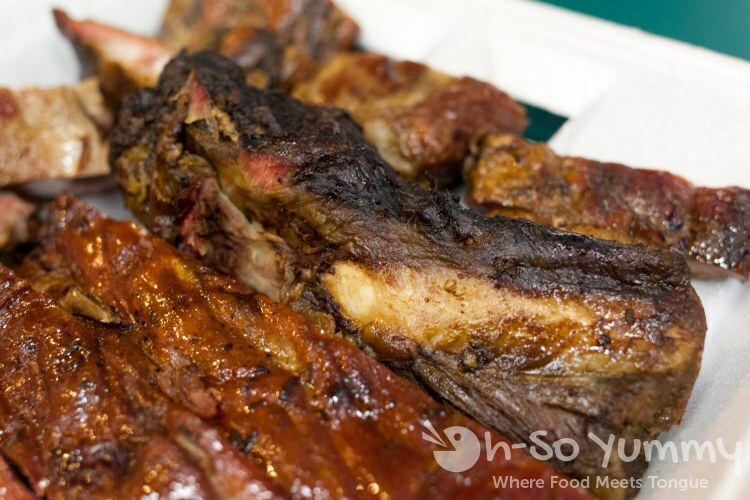 I have to agree with Dennis that the beef ribs are much better at Phil's (minus the sauce for me). We decided not to try the pulled pork that day since we make it several times a year and in huge volume. As part of the combo, we had a choice of two sides. The Potato Salad received moderate approval and was similar to the Von's brand for me. 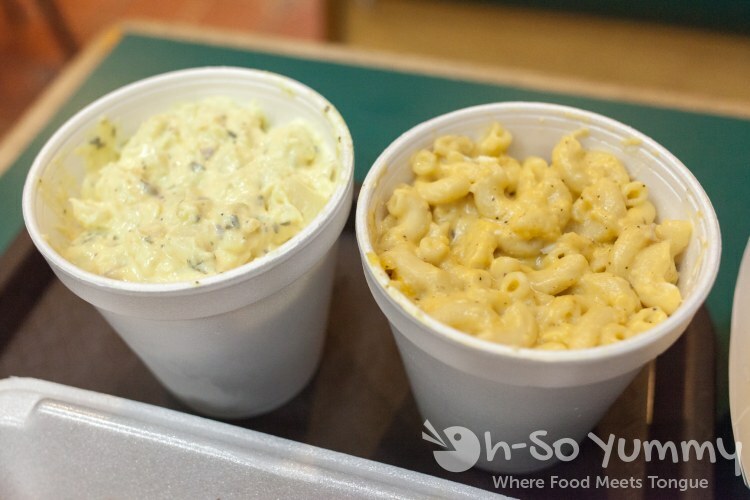 Our favorite side was the Mac & Cheese, not too cheesy nor oily. The texture was just right as well as the price. 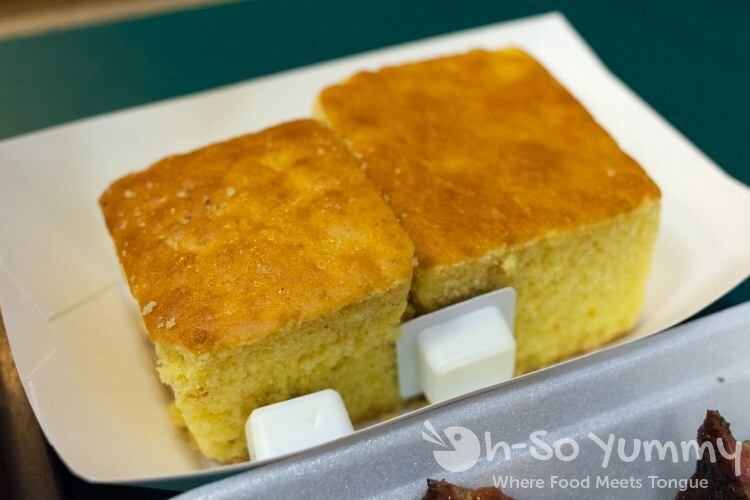 The last part of the combo was the corn bread. It was more cakey than crumbly in texture which also kept it together for each bite. I didn't even need the butter provided and thought it was one of the best ones I've had at a restaurant. Our nephew met up with us later and ordered the Spuds n Que with brisket meat. 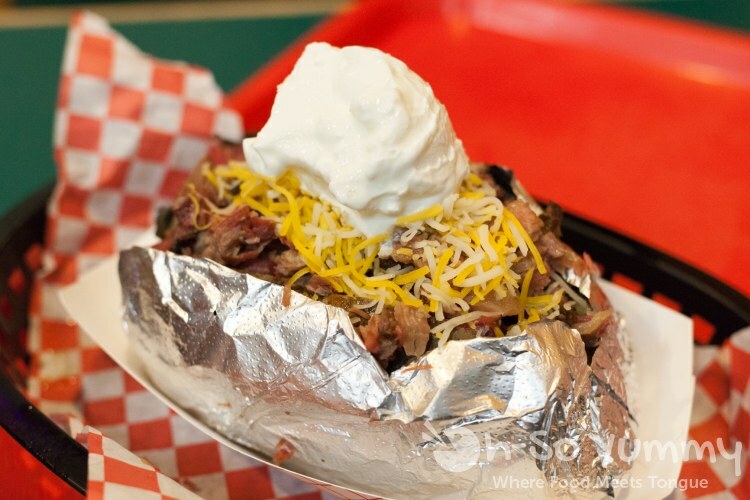 Now this was a super loaded potato! I feel like I haven't eaten a baked potato in years and this buttered creamy pile hit the spot. Nephew likes collard greens though I find most are too bitter for me or Dennis. 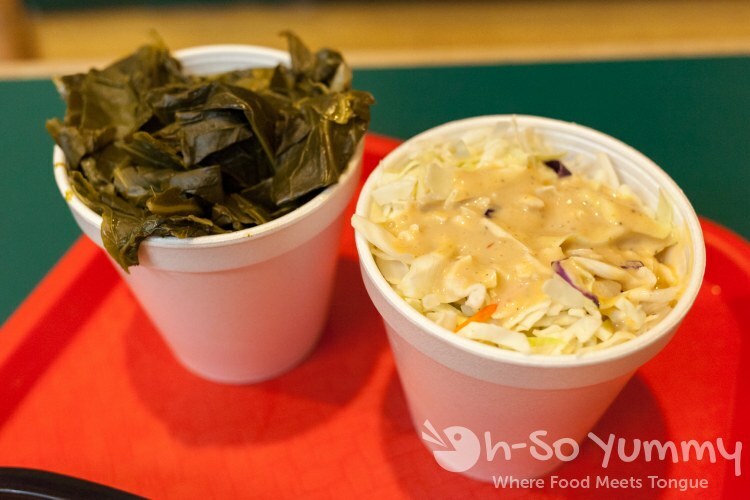 The slaw on the other hand was not the typical mayo flavor. Dennis thought it was like thousand island with a kick. For me, I was reminded of a bbq style slaw. We didn't really care for this version though. The sides alone were $6 each and the meat per lb was 12.99/lb so getting the Knockout Combo really does give you more bang for your buck. And variety! Dennis wouldn't recommend getting the pork tips if you're already getting the pork ribs. We've never had it before so we wanted to try. 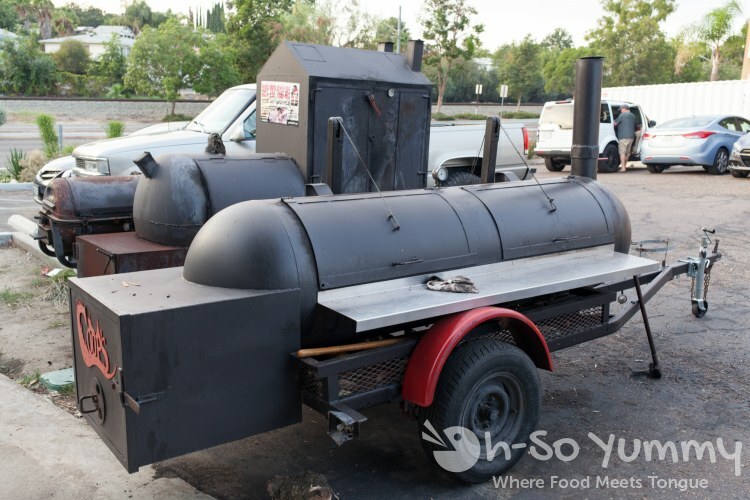 Despite being busy, the parking was easy on our visit, even with this huge smoker sitting in the midst of the parking lot. I'm sure this equipment is put to good use to keep up with demand. 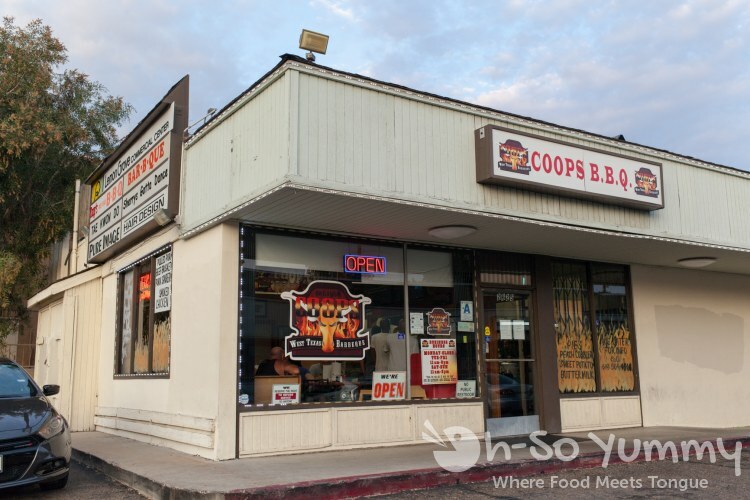 Coop's BBQ is closed on Mondays but open until 9 on weekdays and 8 on weekends. Too bad it's farther from home but seems worth the drive. I would come back here just to buy brisket and some mac & cheese. 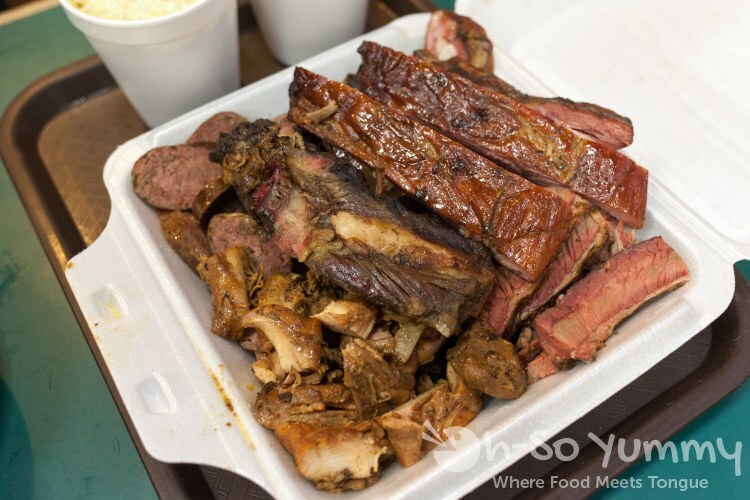 What's your favorite BBQ place? *update* This restaurant has closed. I'm glad I finally got to try it too! I'm going back during my birthday month because there's usually a coupon from ibirthdayclub! 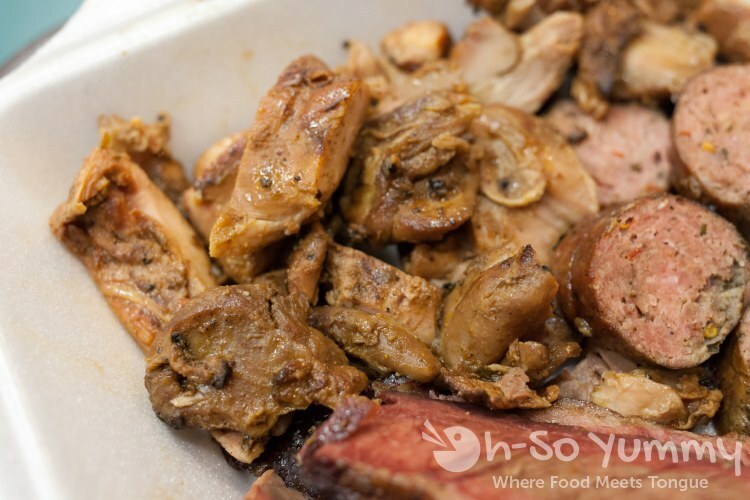 have you tried grand ol bbq yet? it's the newest place that's popped up and lots of people seem to rave about it. This one has been on my list! I'm from the South, so good BBQ is a big deal. Will check it out - thanks! i'm from texas but apparently i missed the bbq train. i try a new place every time i visit now! Wow! I gotta try the knockout combo next time. I usually just get pork ribs. Coops is my fav bbq place. What is your fav in San Diego? so far, this has been my favorite one between sque, wood ranch, and phils. 2+ years ago i tried lil' piggies, bubba's smokehouse, and abbey's but don't remember much anymore. 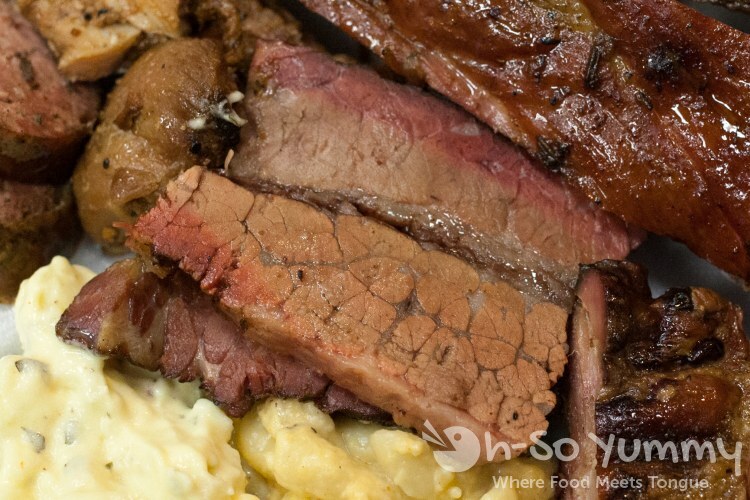 i have a gc for cali comfort bbq so that and grand ole bbq are next on my list! Yay! I'm glad that you finally tried Coop's and glad that you liked it :) I also want to try Grand Ole BBQ too! GAHH! I FRIGGIN ADORE AND CRAVEEEEE BBQ so so os ososososos much! This looks soooooo good, I am drooling!